The smooth walls inside the pyramid angled upwards into darkness, lit only by a muted glow that seemed to emanate from the stone itself. Coming in out of the blazing sun was a relief, but as we walked up into this sacred temple, our ahhhhhs faded into reverent silence. We stepped out of the hallway into a vast room; as our eyes adjusted, we could make out barrels, crates and bottles. 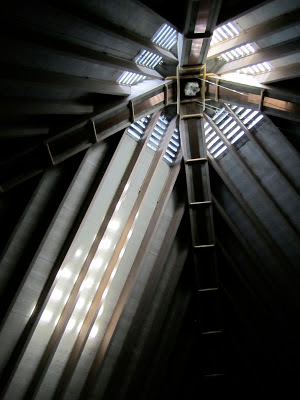 A few shafts of sun angled in through narrow slits in the pointed roof, where a massive crystal hung like some mystical, thousand-year-old chandelier. This is the magic of the Summerhill Pyramid. Set on the slopes of Okanagan Lake, Summerhill is hard to miss. There's the pyramid, of course; out front, a gigantic bottle of bubbly poured its contents into a massive flute-shaped fountain (oh, to have one that actually flows with that delectable liquid.) The architecture was equally eye-catching, especially the elongated veranda of the Sunset Organic Bistro that stretched out from the main tasting room. A 1/8 model of Egypt's famed Wonder of the World, the Summerhill pyramid was built by founder Stephen Cipes, according to the principles of sacred geometry. The belief is that the energy flowing through it aids in the clarification of the wines, enhancing its best qualities as the bottles rest in near-ideal temperatures and a holy, undisturbed stillness. Gabe Cipes has become the resident expert on permaculture and biodynamics at the winery. Soft-spoken, moccasin-clad and be-dreaded, he peers out through old-soul eyes at the world, looking for ways to restore its balance. He plants and reaps according to the cycles of the earth and moon, and whether it's a 'fruit' or 'flower' day on the dog-eared schedule he carries with him. He doesn't like it when people come into the pyramid with cameras or cellphones; apparently, it messes with the energy. What he does in the vineyards goes beyond the basic tenets of organic farming. "Everything that grows here protects and benefits from everything else, with very little human intervention," he said. "It's the solution to the world's current economic and ecological problems." Then there's the winemaker, Eric Von Krosigk. 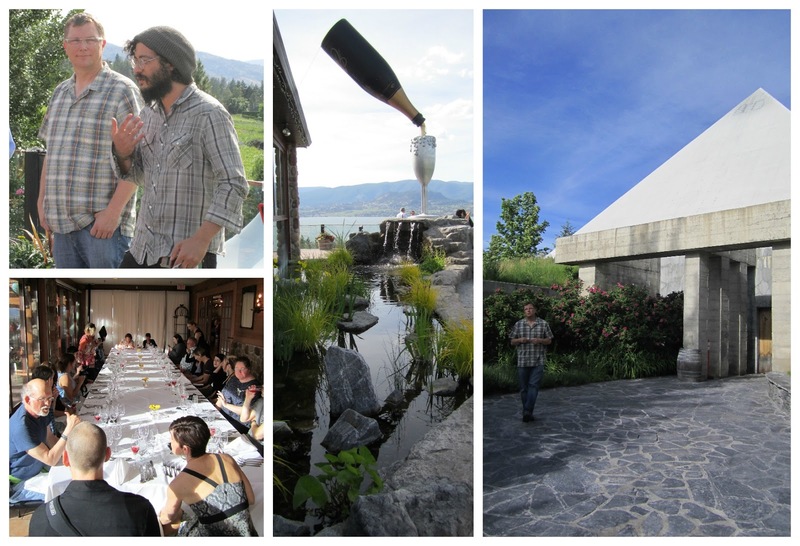 A born farmer, he flew off to Germany to study the art of making wine and then came back to Canada to lay the groundwork for some of the Okanagan's most renowned wineries, including the one with the big concrete pyramid in the back yard. As we talked, he made the odd joke about the finer points of biodynamics ("It's quite the sight to see Gabe stuffing entrails into cows' skulls right outside the winery door," he quipped) but spoke very seriously about his goal to make the best wines in the world. And judging by the international medal tally the wines have earned, they're not far off the mark. Whatever it is they're doing here--whether it's influenced by pure science, divine intervention or a little bit of both--they're doing it right. A different kind of environmental stewardship was in the works just down the road at Tantalus Vineyards: the apiarian kind. Helen Kennedy, of Arlo's Honey Farm, was waiting for us, all suited up in beekeeper's armour and wielding a smoker. We watched in awe as she slowly lifted a comb from the hive, its surface still writhing with thousands of bees. All the while she chatted away about these miraculous insects. Did you know that 60,000 bees can live in one hive? That it takes 12 bees to make one teaspoon of honey? That propolis, a by-product of bee spit and sticky stuff, has been used for years as an antibiotic, an anti-inflammatory and even in the treatment of some cancers? The worker bees (females, of course) do everything from collecting pollen to raising young and even pushing out the bodies of their expired hive-mates during the winter to keep everything running ship-shape. They travel for miles following the scent of their queen and do a nifty little dance when they get back, just to let everyone know they're home. I marvelled at how such a tiny creature, running entirely on instinct, could know exactly what needs to be done to keep everything in cohesive balance, while us humans at the top of the food chain can't seem to step anywhere without wrecking it. Helen told us about how neonicotinoid pesticides in crops are contributing to bees dying off in terrifying numbers. World, take note: a staggering 70 per cent of our food depends on honeybee pollination. No bees, no food. No bees, NO WINE! In order to return the earth to its once bountiful and balanced natural state, we could learn a lesson or two from the honeybees, already centuries-deep in their own innate cycle of energy-saving measures, waste management and population control. The other stop on our pre-conference tour was at CedarCreek Estate Winery. Good thing we had such a big breakfast, because the folks here had us working for our wine. We hiked up a 45-degree incline through the vineyard, stopping at tasting stations interspersed among the vines. We were rewarded for our efforts with small plates and matching wines from the estate portfolio. And water. LOTS of water. Cuz you don't want to rehydrate on wine alone and then try to tackle that route DOWNHILL, let me tell you. Many thanks to Tourism Kelowna's Jenny and Catherine, our fabulous guides and organizers, and our bus driver, Berne, from Distinctly Kelowna Tours. Are you going to be allowed back being you took a camera into the pyramid? LOL! Certainly hope so. Magnificent place! Thanks for the compliments. Lovely post Bethany! I can imagine the pyramid when I read your words. I'm glad you had such a great time! Thanks for the compliments! It was a fantastic experience. Hope to go to the next one in Santa Barbara, CA. Wow Bethany... what can I say? Your words are so beautifully chosen to weave together all the special moments of that day. In your descriptions, I get to relive it all. Thank you. 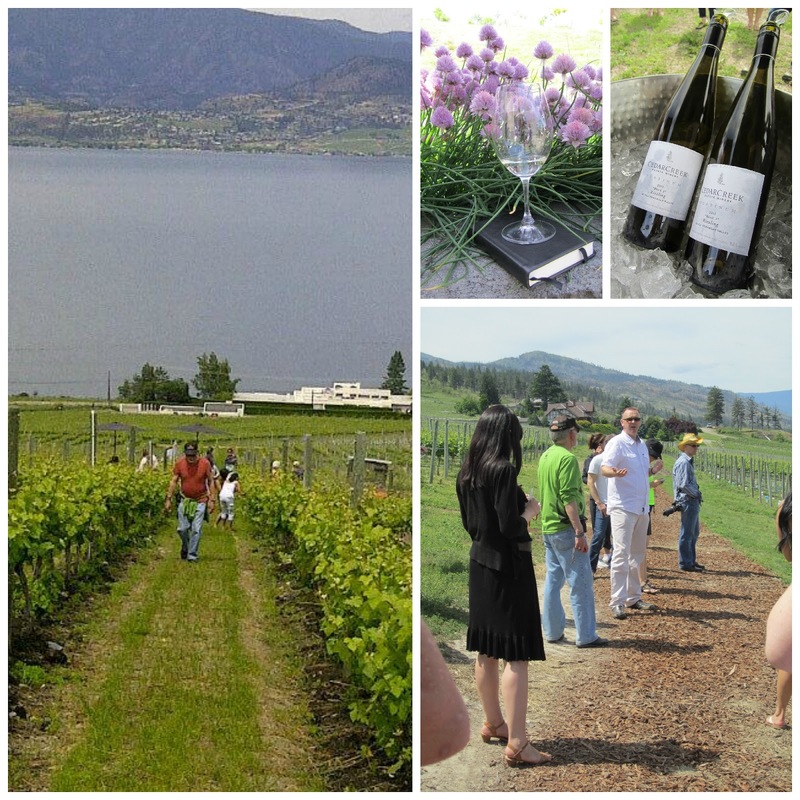 I was proud to get to show everyone around to these three wineries - some shining examples of the many neat experiences for people along our 5 Wine Trails in Kelowna (www.kelownawinetrails.com). So glad you made it to Kelowna, Bethany!